I’m part of this amazing group of women crafters that have a yearly holiday ornament exchange. This was my first year participating! It took me forever to figure out what kind of ornament to make. I also didn’t even know how to begin since it was a secret santa kind of thing so I didn’t really know the person who was receiving it. 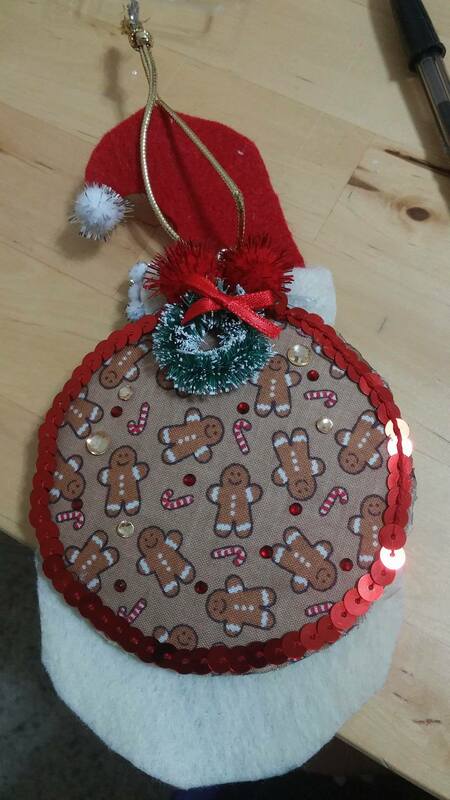 Anyway, I decided to write my own version of the “Night Before Christmas” to go along with the ornament I made. 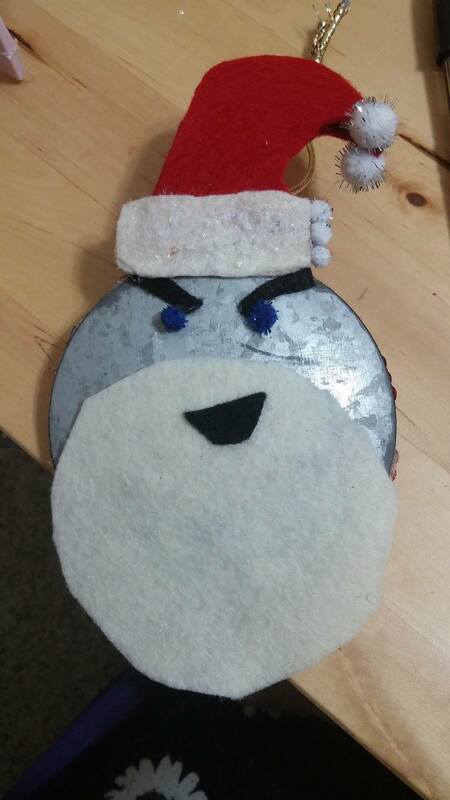 I bought a round silver ornament that can be found at Michael’s (the hobby store if you’re unfamiliar) and decided to make it a Robot Santa Claus except this one would be Robot Saint Klaus, and he would be a misunderstood mechanical robot Santa. This bit was entirely written by me so please don’t steal it. If you feel like sharing it, please credit the author! This is Saint Robot Kalus. He’s vicious and uncaring. He has a scar under his eye. You will not get presents if you weren’t nice. Their stockings were hung chalk full of grenades in case the barred chimney would suddenly give away. The families were huddled behind great big forts all of which were full of hot chocolate and weapons galore. They dared not rest, much less sleep, for a restless night filled with nightmares of Saint Robot Klaus is what they would seek. When out across the lawn atop the barbed wire there came a loud sound a much fear-filled shatter. “Go, Klanker! Go, Iron! Go, Screwy! Go, Whisky! On, Rampage! On, Cookie! On, Regret! On, Flipsy! The house then shook; the cookie-filled plates fell and shattered. Saint Klaus was approaching much haste was required. Together the families all huddled in fear. Their weapons were ready; Saint Klaus was near. “Hold on, everybody!” said nice little Pete who came out of the trenches to share his delicious Christmas treats. “I think we’ve forgotten what this time is about. I say we speak to this wretched Saint Robot Klaus! Tonight, isn’t the time to be gathered in fear! Christmas Eve was once a night filled with jolly and cheer! Atop of the chimney a menacing beep boop are heard, as the data is downloading to Saint Robot Klaus’s server. “I have mail? He said and could hardly believe. It had been a very long time since a letter he had received. A BOOM AND A CRASH and a loud metal clatter, Saint Robot Klaus was among them. They all shook! Their teeth clattered. “A letter! Proclaimed the fearsome Saint Robot Klaus, some kindness is all that I ask just simple words of encouragement to help me accomplish this daunting task. I’ll deliver the joy and presents galore. I just ask for some appreciation and care in return”. An agreement was reached as they all gathered closer. “We should have considered your feelings, Saint Robot Klaus. We’ll remember to write and never dawdle. Thank you for letting your grievances be heard, we will not falter. And this was the start of a jolly-filled year, where families gathered to write Saint Robot Klaus letters filled to the brim with appreciation and cheer. This is the back of him which is meant tor represent all the jolly feels he has inside. I’ve decided to start a new holiday tradition in which my family will recite “The Email That Saved Christmas” and while we hang up Saint Robot Klaus on our tree. This will remind us to not take our actions so lightly, to be good, and to be considerate towards everyone, especially our mechanical friends. A new and clever Christmas story!